Hi! 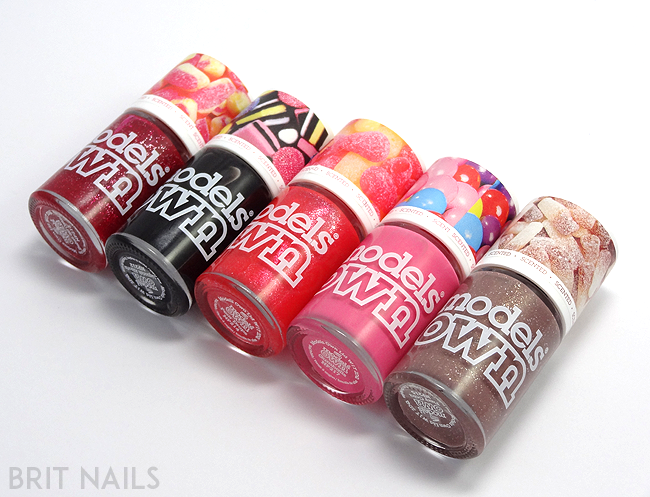 today I've got the brand new Models Own Sweet Shop Collection to show you - 5 scented polishes inspired by retro sweet shop favourites! Models Own have proved themselves to be great at making scented polishes with the Fruit Pastel collection, so I was eager to try these, especially as they're inspired by sweets! 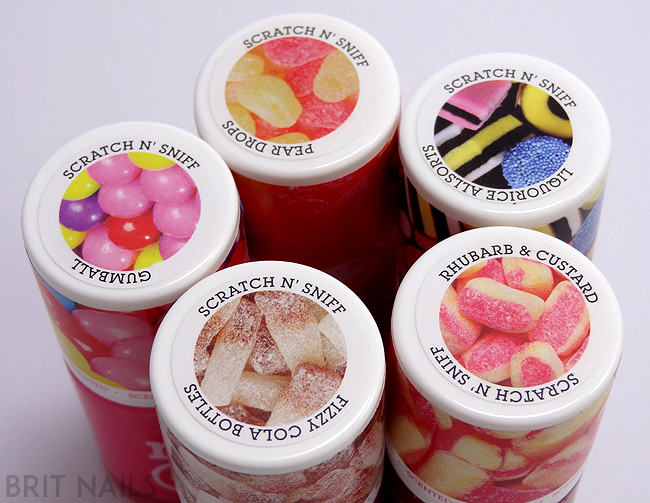 They feature scratch and sniff stickers on the lids just like the Fruit Pastel polishes, and they work really well; I've scratched and sniffed them a few times now and they're still going strong! The lids are also printed with their corresponding sweets...they're just so cute! This collection contains 2 cremes and 3 glitter/shimmers. I was pleasantly surprised to see it contained some glitters because it's not all that evident on the press release pictures. I'm starting with my favourite! Fizzy Cola Bottles is a light brown creme base with silver micro glitter and gold shimmer. This is a really gorgeous polish, from the PR pics I was just expecting a brown creme! The gold shimmer really makes it perfect and it really does smell like cola bottles, although after a while it reminded me a bit of aniseed, not sure if that's just me though!? The formula is great, 2 easy coats plus top coat. Rhubarb & Custard is squishy jelly goodness! 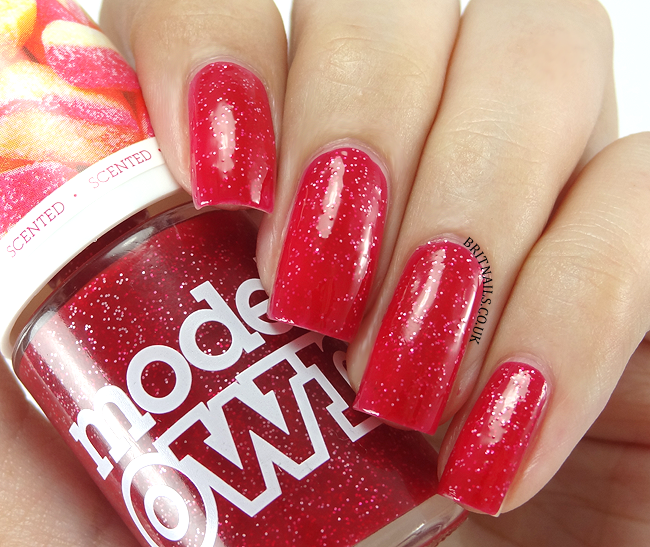 Red jelly base with silver glitter. The scent isn't as strong as the others, but it's still there. I used 2 coats and top coat. Liquorice Allsorts is a plain black creme. GAH, I really can't bear the smell or taste of Liquorice! I think you either love it or you hate it, and this definitely does smell like it. I didn't have much fun swatching this one! The formula is decent, quite thick and opaque in 2 coats. 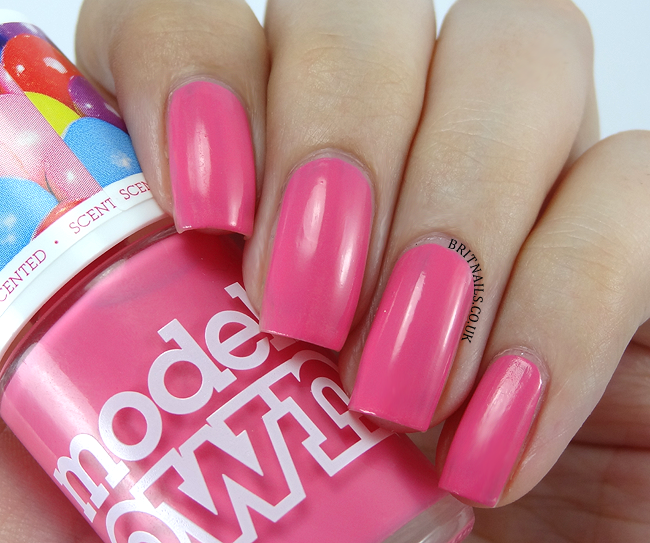 Lastly, Gumballs is a pink creme, similar in formula to Liquorice; thick and opaque in 2 coats. This one smells delicious! Definitely my favourite scent of the collection, it smells exactly like gumballs and reminds me of being a kid! The cremes may be plain but the glitters/shimmers more than make up for it! It's great to see that they haven't just gone for plain cremes in this collection, and the formulas are all great. As with all new collections, I'm left wondering what they could add to it in future...I'd love to see Rosy Apples! What's your favourite sweet? - Available now from www.modelsownit.com and Models Own Bottleshops nationwide. - Available in Superdrug from 30th July. The liquorice and the pear drops ones looks amazing! I want to see Parma Violets. Would be a lovely colour too. I can't believe I'm seeing you say 'love' for a red, but you've made me want a couple. 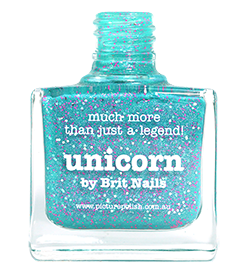 I'll pass on the black though, I don't hate liquorice but I am not one for smelly polishes, even nice smells. I'd rather a normal polish and a bag of pick n mix myself. Oh and black in two coats? I think they could manage a one-coater black surely. It's a pity I can't purchase them here in Spain. I think I'd love a liquorice-scented black polish!